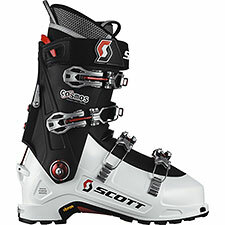 There's a bit of a leap of faith involved in buying a pair of Scott Cosmos ski boots. Just a year ago, the Cosmos was made by legendary but now-defunct Garmont USA. Garmont's parting gift was at least one and possibly two critical design/manufacturing flaws embedded in the otherwise-stunning Cosmos. Early adopters (including me) thus found themselves not once but twice burned, as we learned (1) Garmont's Cosmos tech fittings were bogus and (2) Scott USA, which was in the process of absorbing Garmont, wasn't going to do much about it. In fairness to Scott USA, they didn't create the problem, and they've since worked hard to fix it—in the Scott-branded version. And if there's a little bad blood now between Scott and consumers and retailers who got stuck with the bad Garmont run, C'est la vie. On the bright side, Scott appears to have fixed the tech fitting problem, and they've also reworked the ski/walk lever mechanism. Aside from the graphics, everything else returns unchanged, which is a good thing, because lost in all the drama of last year's fiasco was the tragic reality that the Cosmos was, and is, one of the finest pure ski mountaineering boots ever made. Design and build issues aside, everything I said then about the boot remains true now: it's fantastic. So, if you have faith that Scott has successfully resolved all the problems they inherited from Garmont, or if you just love the boot too much to ski anything else, sell your Garmonts on Ebay and get a set of the Scotts. I've examined my pair, and as far as I can tell, the tech fitting issue has been resolved. It also appears Scott has eliminated the (less-widely reported) problems with the walk mode assembly. Tentatively: great. I still want to put a lot of snow time on these before I'm going to say I trust them completely, but at this point I am at least highly encouraged. As for the boot itself, I'll quickly note its combination of climbing and touring comfort, downhill performance, and impressively light weight remains the best of any A/T boot I've tried. Fit stays exactly the same. I can't say for sure, but I think the width has crept up slightly from the protype I first tried two years ago. In any case, the toe box is roomy, and I'd say volume overall is firmly medium. The liner returns unchanged from the Garmont edition. The walk mode assembly has been strengthened, and the shell reinforced slightly at the switch box. Interestingly, I have seen criticisms that the Cosmos is too soft from a few other reviewers. That hasn't been my experience with the boot, but it is something I'll be paying more attention to, and doing more extensive comparisons of, as this season develops. Otherwise, let's hope Scott has done its job and fixed the boot, so we can talk about what's great about it, rather than what's broken.